Marketing research firms still do pay consumers to take in-person surveys and to participate in focus groups. However, the internet has granted them a more efficient way to collect data. So, many firms now conduct legitimate online paid surveys, virtual paid focus groups, and other types of paid online marketing research. 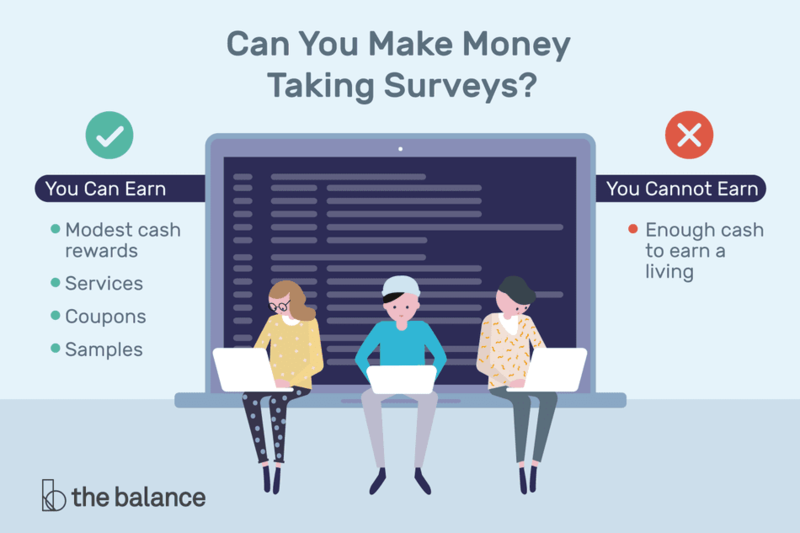 There are also many questionable "middleman" third-party paid survey sites that hype easy money for participating in online marketing research from home. Here, the old adage is true: if it sounds too good to be true, it usually is. Further, it’s worth knowing that there’s a lot of competition among these companies for your participation – which means potential for exaggeration, at the very least, if not outright scams. You want to avoid the dodgy sites and stick with the legit ones. The best way to make sure is to take surveys directly on the site that is seeking feedback, and skip the middlemen. There are sites that charge "membership" fees for lists of marketing research firms that conduct online paid surveys, despite the fact that you can find many of these surveys free by simply searching online. These services compile lists of surveys that anyone could find in an online search, and then try to dupe you into believing their lists are special. However, according to messages on scam forums, their lists are essentially the same as all the other middleman sites. Worse, some also list other membership sites, trying to trick you into buying essentially the same list over and over again. They include sites that seem to be their competitors because they earn referral fees when you buy memberships. A couple mentioned in scam forums even try to dupe you into buying the same list at other membership sites they own under different names. Naturally, these sites also have an incentive to exaggerate how much you'll earn from online paid surveys. If anybody is earning a living from online paid surveys, it's probably the middleman-site owners, not participating consumers. Most surveys "pay" only token rewards in the form of goods, services, coupons, or samples. Many pay cash only through sweepstakes drawings. Even if you're lucky enough to win a few sweepstakes, it likely won't lead to early retirement. Prizes at most sites range from $5 - $200 in cash or goods, and drawings are only occasional. Here are some of the most reliable sweepstakes sites. Some pay with points that are redeemable for cash or goods and typically you must rack up a bunch to redeem them for anything of significance. Others may give you a gift card, discount, or another token of appreciation for participating. Many others pay nothing or only offer sweepstakes entries for completing screening surveys to determine your eligibility for other, paid surveys. A few don't pay much of anything, unless you recruit others, as in a pyramid scheme. A few paid survey sites do pay relatively well in cash. However, many sites hype hypothetical, best-case scenarios that can't possibly apply to each and every consumer for each and every hour of participation. In the real world, the likelihood that you'll often earn the higher of the hyped amounts is slim. Most online paid surveys simply don't pay much, and you must be invited to complete them. To be invited, you must fit targeted demographics. That alone limits your earnings right off the bat, as you can't possibly fit every demographic. Subsequently, despite what middleman sites imply in their "dream job" hype, it's unlikely that you'll earn a living from paid surveys and other marketing research. You will, however, likely earn or win some extra spending money, or free or discounted goods or services. Most reviewed paid survey sites effectively promise not to share personally identifiable information or not to share it without your consent. It's an industry standard by which legitimate marketing research firms are bound. But many membership sites reviewed don't make either promise or do so only in a limited or wishy-washy way. Unauthorized go-betweens don't have to honor marketing research privacy standards. By joining a membership site, you might have allowed it or its "marketing partners" to solicit you. Your personally identifiable information is worth a small fortune to direct marketers, especially since the U.S. Federal Trade Commission limits unsolicited telemarketing calls and consumers can sign up for the national Do Not Call Registry. Ask yourself if a few extra bucks, iffy sweepstakes, and other token rewards are worth the aggravation of dealing with potentially dozens of privacy invasions that offer nothing for your time. Before you sign up, review these tips for protecting your privacy online, so you don’t jeopardize yours for a little bit of extra money. Ultimately, it is very unlikely that participating in online surveys will provide you with a steady, livable wage. However, if you enjoy participating in online surveys (especially if you like the prizes, coupons, and other more typical non-monetary earnings), be sure to avoid questionable third-party sites. Look for real paid surveys online that don’t require you to invest money.